One frustrating thing about cooking for just one or two people is that most prepackaged food items come in 4 to 6 person serving packets. Although I try to minimize the amount of prepackaged or processed food that I eat, sometimes it’s just easier to cook from a mix- especially when it comes to baking. But recently, I started experimenting with a way to effectively and accurately split boxed baking mixes like biscuit mix, cake mix, and other dry products like flaked mashed potatoes. There really isn’t one- all you need is an accurate kitchen scale. Actually, I don’t even use a kitchen scale, I use a postage scale! Scales accurate at weighing just a few grams to 20+ pounds used to be expensive, but now $15 bucks will get you a scale that can weigh anything from a few grains of rice to a heavy package. Having a scale that serves dual purposes is bonus for me as a tiny–living city dweller who not-uncommonly schleps stuff on eBay. My cute little rose gold scale shown here weighs things ranging from 1 gram to 86 pounds and set me back $20. 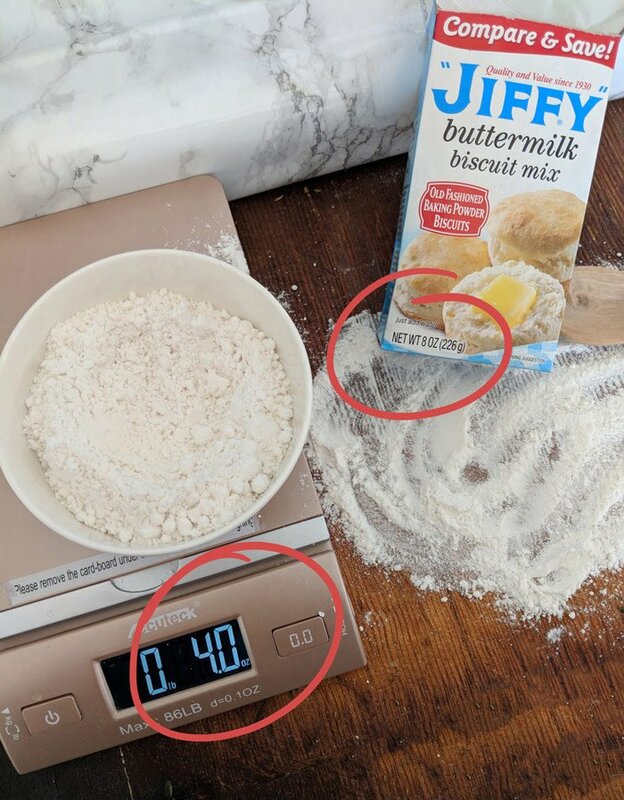 The trick to splitting mixes like brownie mixes, biscuit mixes, baking mixes, and even dry mashed potatoes flakes is checking the weight on the package and doing a little math. For example if I want to split a brownie mix into four separately baked brownies made days or even weeks apart, I just need to divide the dry weight of the brownie mix – always listed on the front of the package in the US – by the number of servings. In this case from a jiffy box mix. 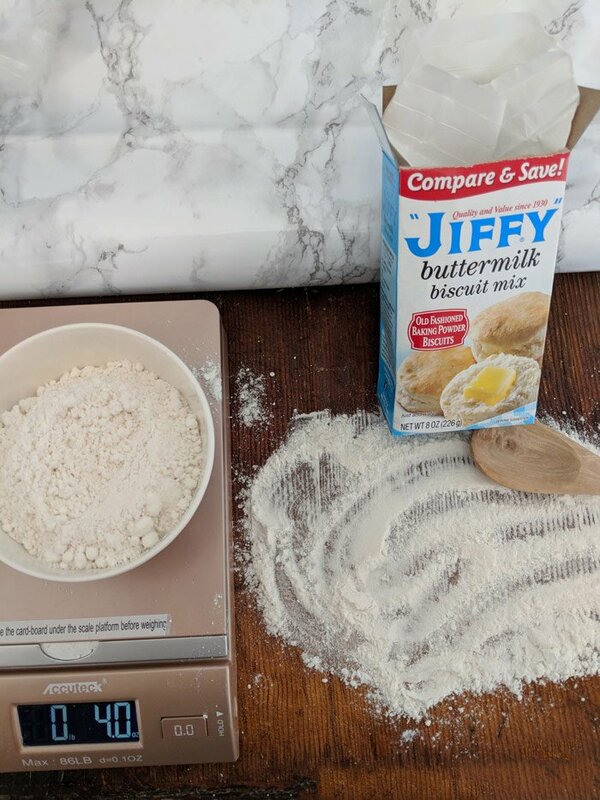 Jiffy Buttermilk Biscuit Mix is so hard to find but makes the best biscuits! When I find it I stock up. Even though Jiffy mixes are in small packages, I still don’t want to make an entire package for one person! 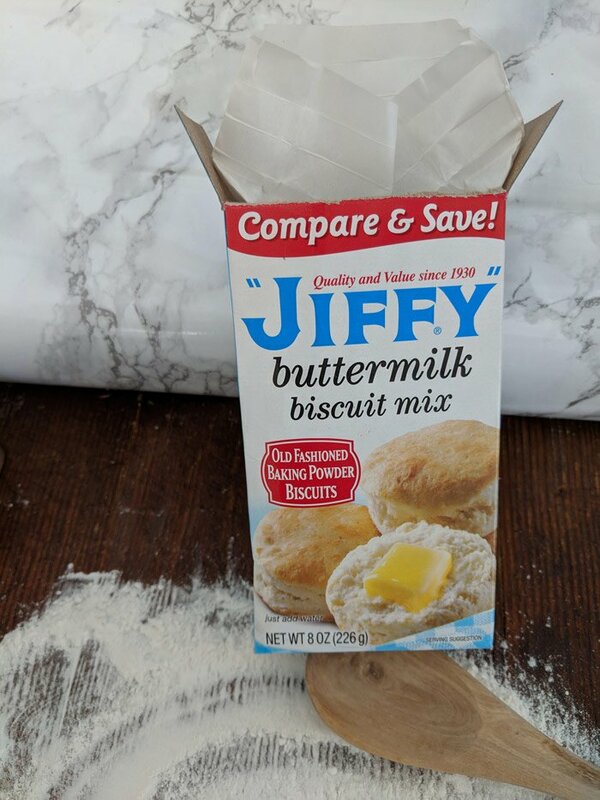 The dry weight of a box of jiffy biscuit mix is 8 ounces. So if I want to make half a box – two biscuits – I need to prepare 4 ounces of the mix with half of the required additional ingredients. when I first started doing this, I would just guess. If I wanted to make one-fourth of a pan of brownies, I would just eyeball it. Invariably, the results were less than spectacular. Baking requires precise measurements and my eyeball more than a few times ruined the recipe. So now when I need to split a box of baking mix I pull out my postage scale and an empty bowl. It’s important to place the empty bowl on the scale first and “zero out” the scale with the bowl on it. This usually means pressing a button with something like “0.0” and that will reset the scale to zero even though a bowl is sitting on top of it. After you have zeroed out your scale, then you can weigh your ingredients accurately. 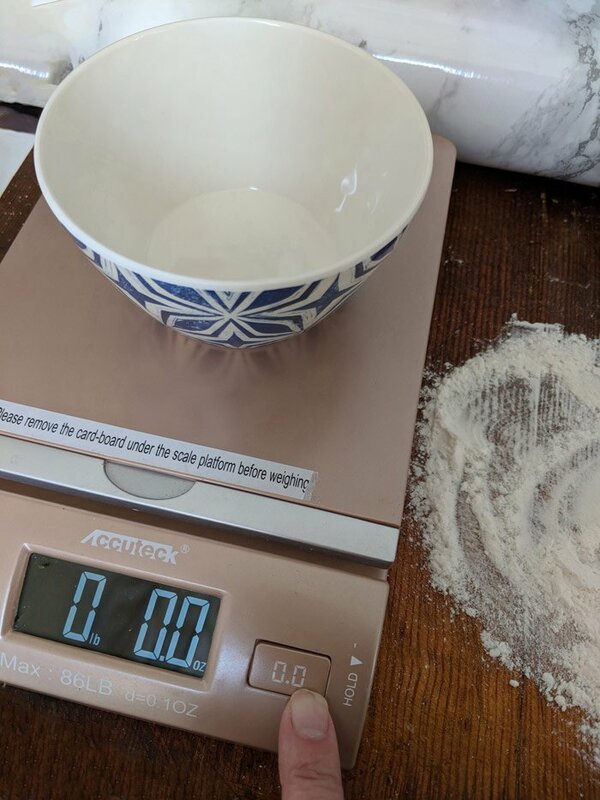 Before weighing your baking mix, place your mixing bowl on the scale and “zero out” the scale-resetting the weight to 0. 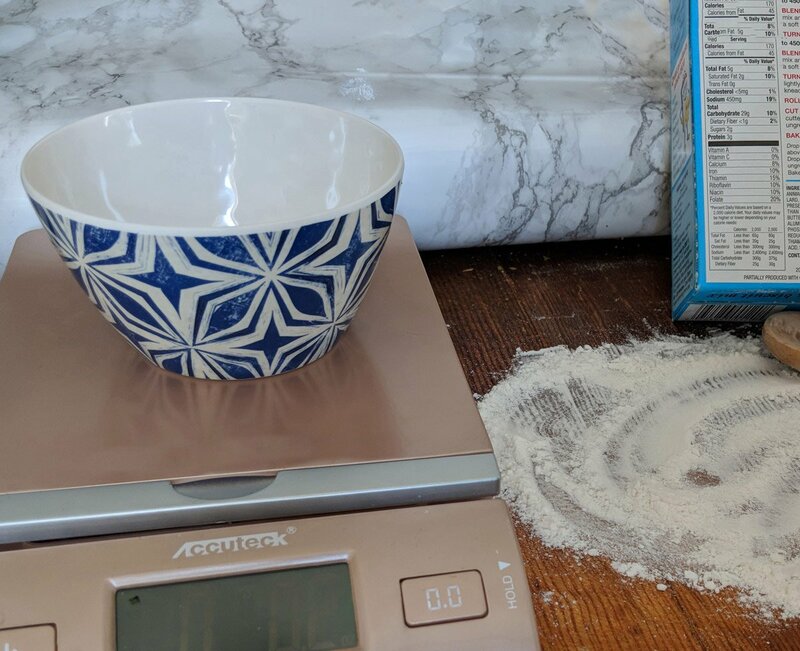 Just scoop out your baking mix into your bowl, set atop the scale, until the scale displays a number that is half of the weight of the dry mix that is listed on the front of the package. In this case, I am measuring into my bowl 4 ounces of dry mix. Normally mixes are well combined, but you may want to stir or shake the box before dumping it (especially in the case of packages that are combined items such as dry pasta and powder sauce mix). Using this simple backing-for-one hack, I have been able to save time by using packaged mixes, save money by not wasting half a package of food, and eng up with a much better product than the “cake in a mug” type confections. It also helps with portion control – I don’t want the temptation of an entire pan of brownies when I really just want one or two servings. Have you tried this method? How does it work? What are your tips for cooking for just one or two people?